Well I’m British, and we like to celebrate our Sunday’s in style: with a large, high calorie roast dinner. In an ideal world we could all eat massive amounts of roast pork with crackling, roast potatoes, yorkshire puddings, stuffing and pile the gravy on top but, come on, that’s just not realistic for a struggling fatty like me. I tend to avoid Sunday roasts, but when I visit home and my family have planned a huge roast dinner how could I say no? So my dad, being the ‘gentleman’ he is, agreed to let me choose which meat to roast so to help support my diabetic diet. You can’t go wrong with chicken, right? It certainly is less fatty than other roast meats, like pork or lamb. Anyhow, why not have a Sunday roast every Sunday if you follow these simple rules..? Fill your plate with plenty of vegetables, fill your belly with plenty of vegetables – whatever, just eat the vegetables. As I did, choose the least fatty meat you can where possible. Even when visiting a carvery you are sometimes given the choice of meat. Roast potatoes? Try roasting sweet potatoes instead, add a little rosemary and some garlic granules (or garlic salt) and make sure you really roast those low GI little suckers. AND, if you substitute your potatoes for sweet potatoes you can probably get away with a cheeky yorkshire pud! ROASTED CARROTS. Normally I absolutely despise cooked carrots, but this time I decided to squeeze a little agarve syrup over them with a sprig of rosemary and MY GOD THEY WERE GOOD. I COULD HAVE JUST EATEN THEM. Don’t ever add goose fat. Why do people even do that? Make sure you have no more than a quarter of the chicken: that way, you’re only looking at about 150-200 calories in the meat. Avoid the skin, too! Don’t overdo it on the gravy – treat it more like a delicate jus with your fancy gourmet posh roast dinner. 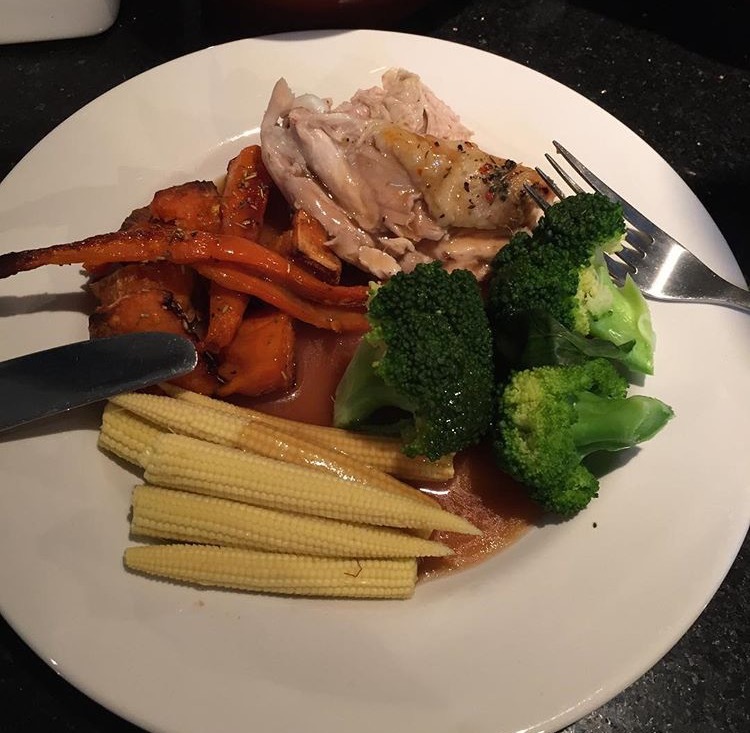 All in all, I must have had about 500 calories in my Sunday roast dinner – which is a dieter’s dream. If anyone here is at all interested in how this meal was made I must disappoint you – my dad bought a ‘roast in the bag’ ready herbed-up chicken that you just bung in the oven. Even still, yum!